Welcome to Buzz - the first in a buzzing new range of quiz shows where you and your friends are the contestants. Featuring 5000 individually prepared music questions - with over 1000 music clips spanning six decades of music - Buzz is the ultimate test of musical knowledge. Coming complete with four specially made buzzers (and a USB hub which connects them all to your PlayStation 2), Buzz is a music quiz that anyone can play, appealing to anyone who's ever listened to the radio! Just when you think the PlayStation 2 can no longer impress you, Sony decide to release something extremely unique to the world of gaming called Buzz! The Music Quiz. Unlike traditional games where players must solve a variety of objectives, fight their way through infinite enemies or sing their way to fame, Buzz! 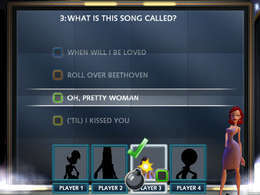 The Music Quiz is a real quiz game for the PS2 that allows up to four players to compete in over 5,000 music questions from six decades of music. 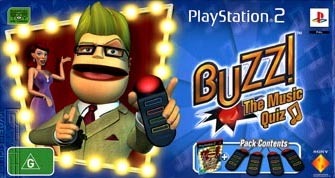 With that said, Buzz comes with four realistic game show buzzers that easily connect via the USB port on the PlayStation 2 and of course one game disc that allows you to star in your very own game show with Buzz as your host. Designed by Relentless Software, Sony were extremely wise in hiring this development company because no longer is the PlayStation 2 a console of children but rather a fully fledged entertainment system that is catered for all ages. 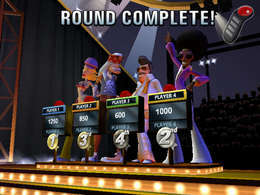 The gameplay of Buzz is rather simple and allows players (up to 4) compete in a variety of different quiz-type games with one winner. Before commencing the game, gamers must select one of sixteen stereotyped pre-generated characters who will be their avatar in the gaming world. Once the characters have been selected, Buzz will give the players a chance to warm up with a variety of different test questions. The scoring system of Buzz is simplistic at best and if players score correctly, they are awarded points with points being deducted for incorrect answers. The designers have done a brilliant job with the buzzers for this title that comfortable fits in your hand with four smaller buttons (red, green, blue and yellow) that are basically used to select your answer. Whoever pushes the button first gets the privilege to answer the question. The questions span from over six decades of music that basically plays a short rift of the song that players must guess which band or person performed the piece. To spice up the gameplay, the gameplay modes are extremely interesting and contain fun titles such as fastest finger and pass the bomb. Fastest finger is self-explanatory with pass the bomb throwing a bomb around to reach player, with the player who gets the question incorrect, loosing the points. 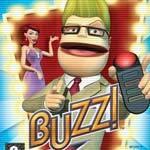 Graphically, Buzz is a rather "cartoony" looking game that actually suits the title perfectly and helps immerse the gamer into the world of quiz shows. The sound effects have all been professionally implemented and add some clichéd voice acting and you have one entertaining game. In conclusion, Sony have a winner on their hands with this one and I'm sure there will be a plethora of add-ons available for this title that will include more trivial pursuit type questions. Great Stuff!